With all the news about Hurricane Florence and the possible impact on our listening area, I thought it might be nice to look at an informal index used by FEMA to judge the severity of the impact of a natural disaster on an area. That measurement is called the Waffle House Index. The Waffle House Index is an informal metric used by the Federal Emergency Management Agency (FEMA) to determine the effect of a storm and the likely scale of assistance required for disaster recovery. GREEN: full menu – restaurant has power and damage is limited or no damage at all. YELLOW: limited menu – no power or only power from a generator, or food supplies may be low. RED: the restaurant is closed – indicating severe damage or severe flooding. The term was coined by FEMA Administrator Craig Fugate in May 2011, following the 2011 Joplin tornado, during which the two Waffle House restaurants in Joplin remained open. 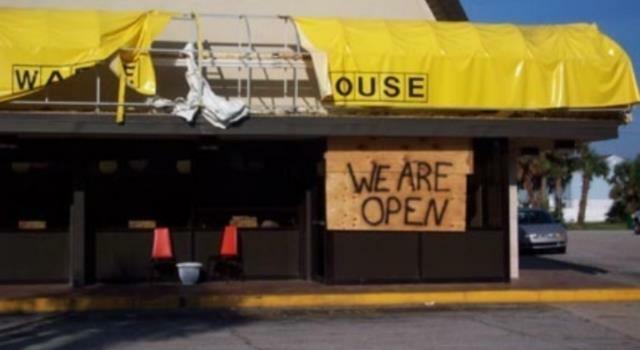 The measure is based on the reputation of the restaurant chain Waffle House for staying open during extreme weather and for reopening quickly, albeit sometimes with a limited menu, after very severe weather events such as tornadoes or hurricanes. Waffle House does a significant proportion of their business in the southern US where there is a frequent risk of hurricanes, have good risk management and disaster preparedness. Because of this, and a cut-down menu prepared for times when there is no power or limited supplies, the Waffle House Index rarely reaches the red level. The Waffle House Index sits alongside more formal measures of wind, rainfall, and other weather information, such as the Saffir–Simpson Hurricane Scale, which are used to indicate the intensity of a storm.